Mega Silvally Flying in game: 19 Who? Important notice! Pokemon Mega Silvally Flying is a fictional character of humans. Silvally (Japanese: ?????? Silvady) is a Normal-type Pokémon introduced in Generation VII. It evolves from Type: Null when leveled up with high friendship. It will change types when it is holding any type of memory. 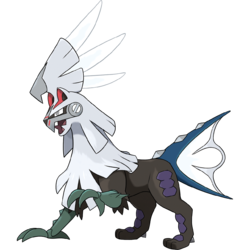 Silvally's chimeric body is nearly identical to that of its pre-evolution; however, the fur from its head turns from gray to silver, and the membrane and spikes on its fish-like tailfin turn white. Without its control mask, its mechanical, lupine head is revealed. Its snout is metallic on its nose bridge and upper jaw, both of which lead to a triangular black nose framed by three red lines. Its upper jaw ends in a sharply pointed overbite, while its lower jaw has two visible fangs, one on each side. Its eyes have white sclerae, bright silver irises, and no pupils. These eyes are mostly surrounded by black coloration, framed along the bottom by its upper jaw. On each side of its head is a circular, metallic port, with a white circle crossed by a metal line. The back of the crest on its head opens up, and three long spikes jut out of it. Its two ears, one on each side of its crest, are short and pointed, with black and red sections on their insides. Once it finds a partner it trusts, Type: Null destroys its own control mask to become Silvally. It reverts to its wild temperament, but it will obey its Trainer and even risk its own life in its partner's defense. 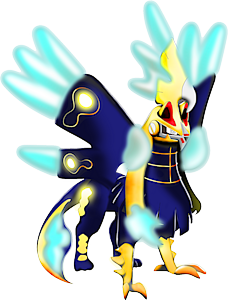 The destruction of its mask re-activates its RKS System, allowing it to change its type according to the Memoryattached to it; its eyes, spikes, and fin membrane all change color to match its current type. Silvally is the only known Pokémon capable of learning Multi-Attack. Its trust in its partner is what awakens it. This Pokémon is capable of changing its type, a flexibility that is well displayed in battle. Although its name was Type: Null at first, the boy who evolved it into this form gave it the name by which it is now known. It destroyed its own control mask. It has become capable of changing its type by equipping special memories. Upon awakening, its RKS System is activated. By employing specific memories, this Pokémon can adapt its type to confound its enemies. For the type effectiveness when Silvally is holding a Memory, see type chart. Moves marked with a superscript game abbreviation can only be bred onto Silvally in that game. Silvally's signature move, Multi-Attack, is the only move that Silvally is guaranteed STAB for, as it is always the same type as Silvally itself. It shares this trait with Arceus and its Judgment. Silvally, like its pre-evolution Type: Null, seems to be based on a chimera. Parts of it also resemble a griffin. Silvally may be a combination of silver and ally. It contains all, which might be a reference to its ability to shift between all types. In-universe, it was named by Gladion. Silvady may be a combination of silver and buddy.